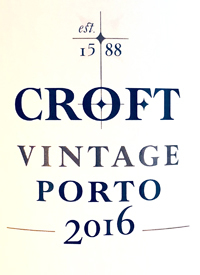 Douro Valley, Northern Portugal, PortugalLove the job The Fladgate Group have done at Croft, completely restoring its reputation and glory and putting it back in the high-level stakes game of Vintage Port. Fragrant, open, generous, mildly showy, this port is ready to go, especially for those who prefer their port full of youth and fruit. The attack mixes sweet cassis and blackcurrants with a savoury firm undercurrent and relatively high acid for Croft. The onerous, ongoing, vineyard restorations are paying dividends. The finish is prolonged and flecked with brown spices. No need to open this until 2025, or store for at least two decades.Tasted: 16 November 2018Tasted by: Anthony GismondiPrices: BC	105.99	BCLS AB	100.00	private wine stores ON	109.00	Producer: Taylor Fladgate PartnershipDistributors: Pacific Wine & Spirits Inc.